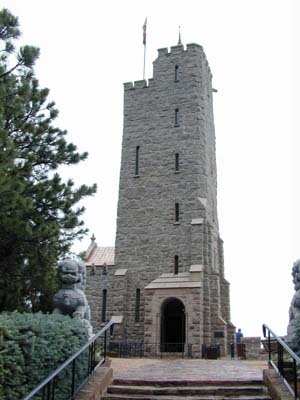 Special Thanks: R. Thayer Tutt Jr.
Will Rogers Shrine of the Sun is located southwest of Colorado Springs, above the Cheyenne Mountain Zoo at more than 8,000 feet, in the Broadmoor area. Take exit 138 from Interstate 25 and go west on Lake Avenue for three miles. At the entrance to the Broadmoor Hotel, turn right on Lake Circle and go about five blocks. Turn left on Mesa Avenue. At the stop sign, turn right on El Pomar Road, then turn left on Penrose Boulevard and continue for one mile. The gated entrance to the shrine is next to the Cheyenne Mountain Zoo and there is an admission charge. According to GPS-derived geolocation (accurate to within 10 meters), the shrine's coordinates are latitude 38°46'20.8"N and longitude 104°51'45.4"W.